Wonder Woman is a DC Comics superhero. 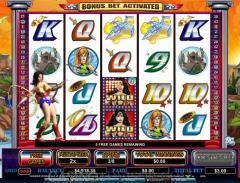 The Wonder Woman online slot has been released by Cryptologic. The introductory clip has amazing animations of Wonder Woman and her archrival Ares. The clip also displays the other symbols on the reels. The wild symbol is Wonder Woman and the scatter symbol is the Wonder Woman Logo. The audio is not up to the mark with there being no background music in the normal spins. The animations in the Wonder Woman and Ares symbols are excellent. Wonder Woman raises her arms and deflects laser beams using her indestructible bracelets. Ares brandishes his sword. The Wonder Woman logo also shows some animation. The other symbols merely flash when appearing in winning combinations. There are 50 paylines in Wonder Woman and as a consequence four rows of symbols are displayed on the reels. Players have to wager one coin per payline by default. The coin size range varies from 0.01 to 20.00. Wonder Woman is the wild symbol. It appears only on reels 2, 3, 4 and 5. It does not offer any payouts but it doubles payouts when participating in a winning combination. Three or more wild symbols trigger the free spins bonus round. In this round eight free spins are awarded at doubled payouts. The free spins cannot be retriggered. This free spins around has a unique feature. 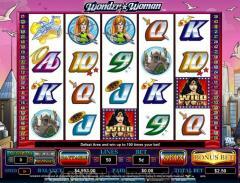 Wonder Woman randomly adds Wonder Wilds on the reels. This is done through an animation in which Wonder Woman appears on the reels and changes a symbol to a Wonder Wild. The Wonder Wild remains in place for five spins and acts as a wild symbol. The Wonder Woman Logo is the scatter symbol. Two or more scatter symbols anywhere on the reels offers scatter payouts. Three or more scatter symbols trigger the Ares Showdown Feature. In order for this feature to be triggered the Bonus Bet also has to be activated. 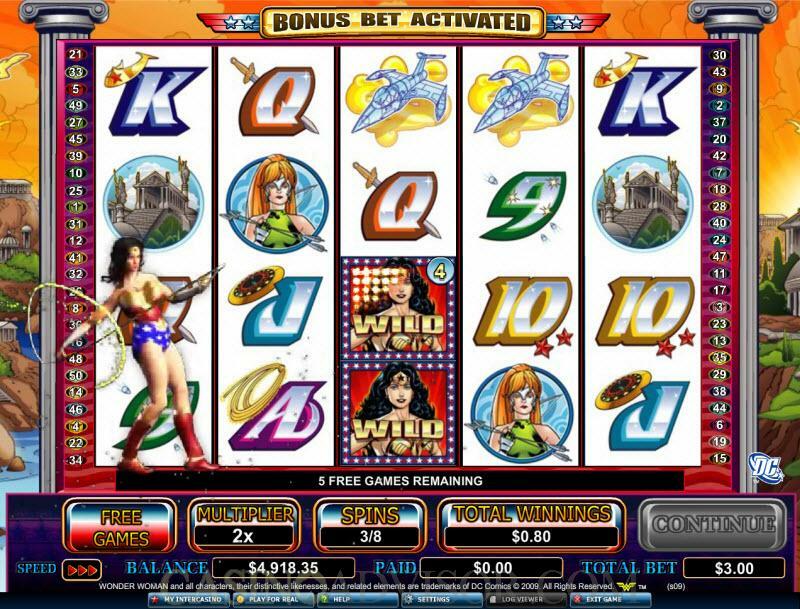 The Bonus Bet in an innovative feature in Wonder Woman online slot that activates all 50 paylines and wagers an additional 10 coins. Hence 60 coins in all are wagered. When the Bonus Bet is activated the scatter payouts are multiplied by 50 and the line bet. In the Ares Showdown Feature, Ares attacks Wonder Woman three times. After the first two attacks Ares sends a zombie horde after Wonder Woman. If Wonder Woman succeeds in defeating Ares all three times then the player can win up to hundred times the triggering bet. The Ares Showdown Feature cannot be triggered in the free spins bonus round. Interested in reading more detailed information about Wonder Woman? If so Click Here for more details.